While some may scoff at the unconventional looks of a one-piece textile suit, Olympia knows that this is a commuter's best friend. Simple and easy to don and doff, yet extraordinarily warm and dry, a one-piece waterproof suit can make all the difference on your daily grind or your extravagant adventure. 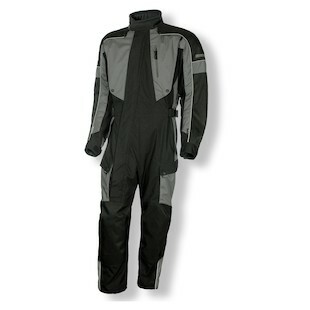 New for 2013, your favorite American textiles company will be bringing the Olympia Odyssey One Piece Suit to the table. Sold as a replacement to the Olympia Phantom, the Odyssey evidences several leaps forward in technology. Constructed with an astonishing 2000D Cordura shell, which is interspersed with 500D Cordura for mobility, the Olympia Odyssey Suit is the ultimate in abrasion resistance. While the shell is completely waterproof, a series of zippers allow for direct venting when open and keep water out when closed. The interior liner is now laminated to the outer shell as opposed to a zip-in mesh lining on the Phantom. This process reduces bulk and improves fit. On the outside, a heavier DWR coating is applied to encourage water to bead and roll off, completely bypassing the waterproof liner all together. The main zipper extends from the neck to below the waist, diagonally. Combined with a side-leg zipper that reaches up to the hip, this makes entry with boots a breeze. The Odyssey boasts 6 storage pockets, of which the exterior are waterproof. Personally, I've always been skeptical about one-piece textile suits, however, when Olympia stopped by a few weeks ago to show us their pre-production model, I had an opportunity to try this on. I was greatly impressed with the comfort and fit of the suit. As a year-round commuter I appreciate the 'total coverage' of knowing that you will arrive dry and warm. 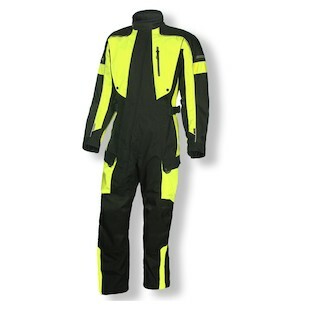 As you might expect, the Olympia Odyssey Suit is available in High-Viz as well, providing a high contrast approach for the cage-conscientious rider.